New watch brands are emerging from all over the world, with many having the idea of using well proven components with a unique mix of elements. For this review I have the Pontvs Fonderia Navale Veneto, one of three lines from the company. Currently Pontvs is offering the Hydra dive watch, the Fonderia Navale Gondar and the Fonderia Navale Veneto. Pontvs is part of the Mansilla Watch Company LLC and the company is located in Lima, Peru. Pontvs is the name of the pre-Olympian sea god in Greek mythology representing strength and reliability in ancient gods as well as in these watches. Fonderia Navale means Navy Foundry in Italian. 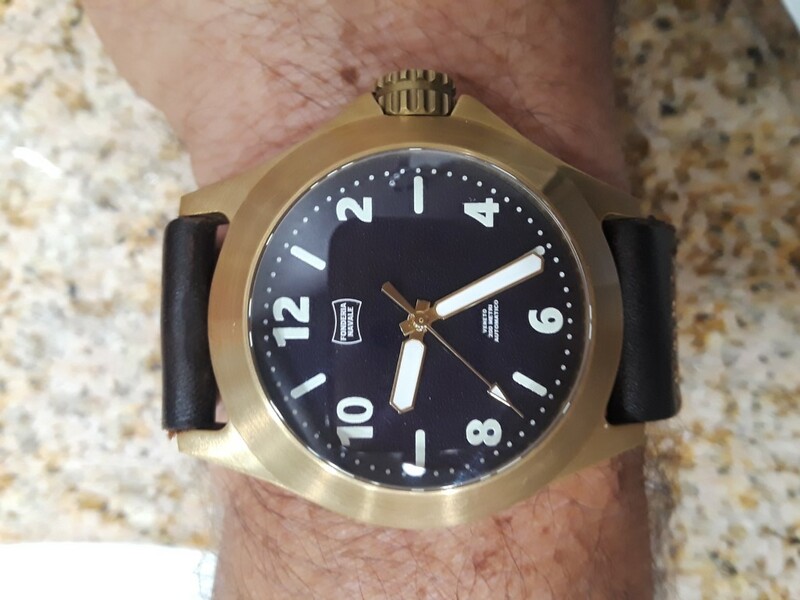 The Veneto, named after a battleship the Vittorio Veneto, used by the Italian Royal Navy during World War II after August of 1940, isn’t marketed as a dive watch but it definitely has dive watch characteristics. The case of the watch is sourced in Asia and is machined from one piece of tin phosphor bronze. Tin is added to the alloy to increase corrosion resistance and the strength of the alloy. Phosphorus increases wear resistance and the alloy stiffness. The alloy is used where resistance to corrosion, fatigue and wear are very important, such as ship’s propellers and it has many other uses as well. 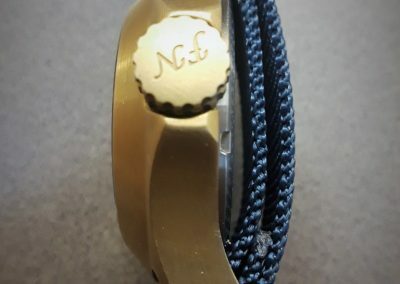 In this watch, it makes for a unique and very durable case with a nicely engraved stainless-steel screw down back and a 9mm signed double gear edged crown. The crown is the easiest to grip and most solid crown I have tried so far with a tight-fitting crown guard part of the one-piece case. 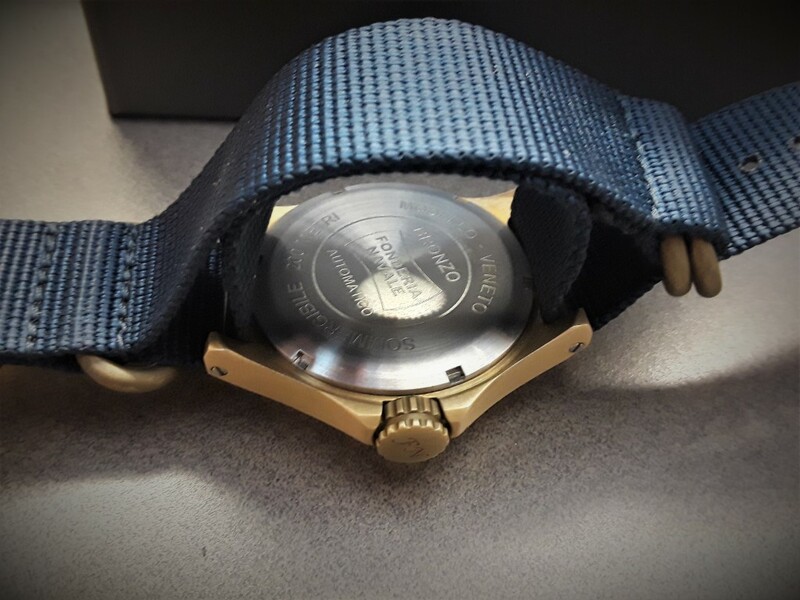 The 42mm diameter case measures 50mm lug to lug, 47mm across the crown and the watch is a thick 14.6mm thick with an anti-reflective sapphire single domed 3.5 mm thick crystal. Inside lug and strap width is 22mm. The watch is rated 200-meter w/r. In my opinion the watch has a deep-sea commercial dive vibe. The 32mm diameter face is made of crushed glass baked in a high temperature oven and all indices are printed with at least 4 layers of Swiss Superluminova C3. The watch is offered with either a blue or green face, though my particular example is a deep maroon color. The train signal like hour and minute hands as well as the second hands are lumed as well and have a shiny brass finish. The watch has six even number indices, six-line indices and 60 second/minute dots. Markings on the upper and lower half of the face are in a very small font and describe the watch model line, watch name, w/r rating of the watch and that it has an automatic movement. All words on the face and case back are shown in Italian. 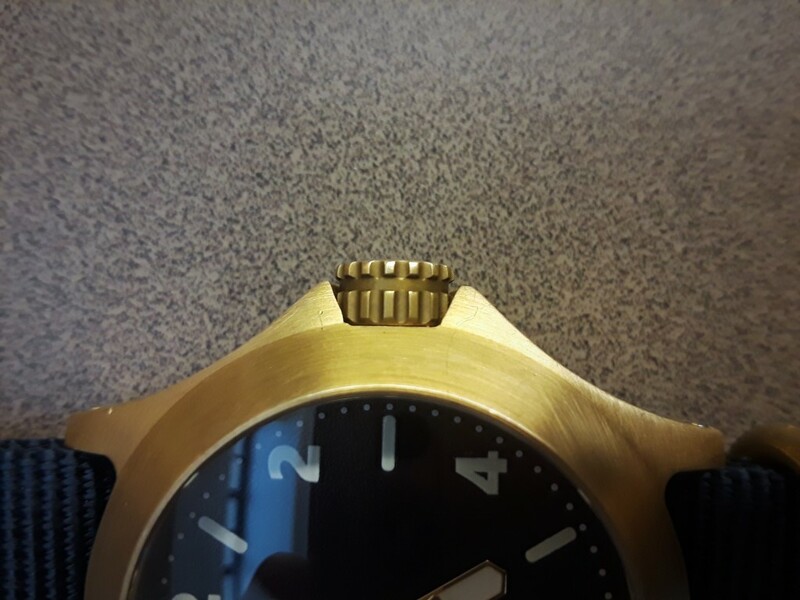 Over time the case and crown of this watch oxidizes to a unique patina that actually prevents corrosion and at the same time makes no two of these watches look exactly alike. Of course, you can modify the patina yourself to whatever you like. There are two stainless screws for attaching the watch strap at either lug. The watch comes on a 3.5mm thick brown leather strap. 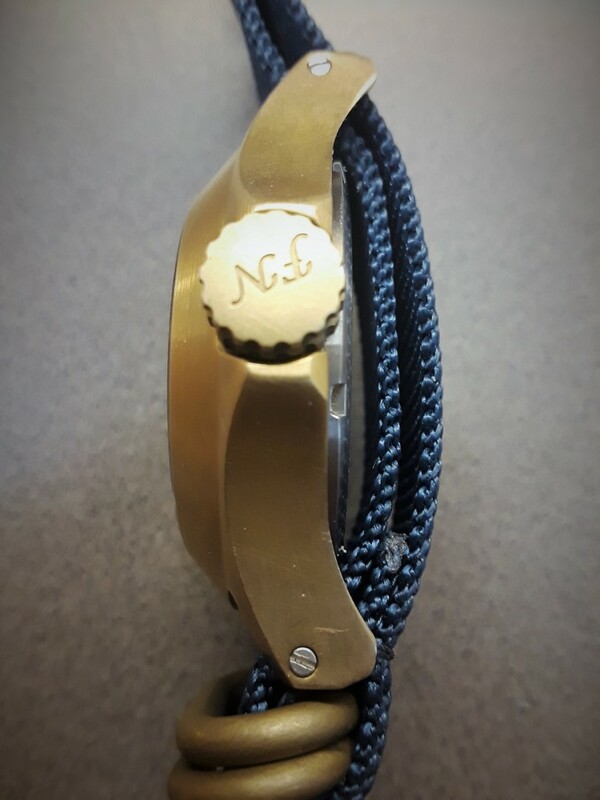 A blue Zulu strap with brass retaining rings is also included with the watch. It is the strap that I prefer on the watch, since most leather straps are not designed to get wet and the Zulu strap is easier to get a precise fit. 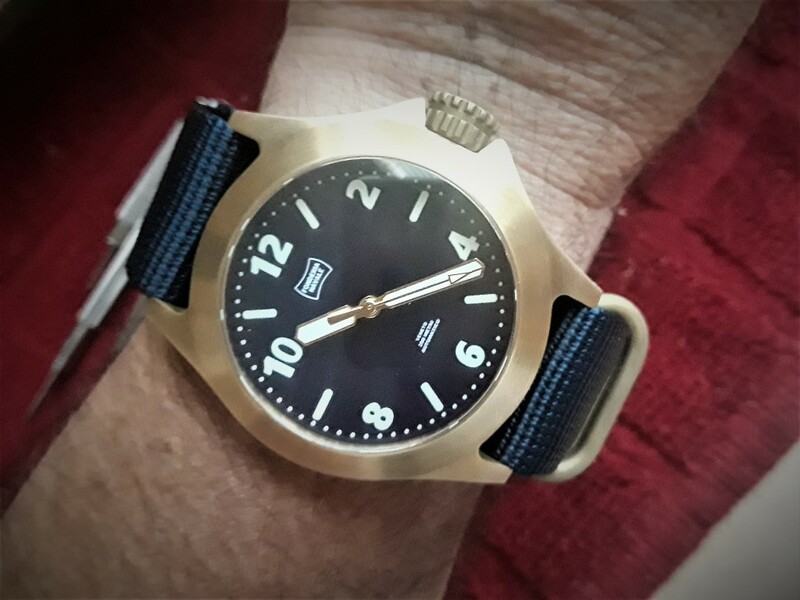 There are 13 holes in the Zulu strap which should make this watch an easy and comfortable fit to any size wrist, despite it being rather stocky and thick. Powering this watch is the ubiquitous TMI NH35A from Seiko Instruments, which needs no further introduction. It is reliable, accurate and very easy to operate since it is hacking and hand winding. In this application it does not have a date window. This watch is definitely not a cookie cutter homage and since it doesn’t have a dive bezel (which no one likely uses anyway) it’s really an easy to notice, all activity type of watch that should hold up to almost anything you throw at it. www.pontvswatch.com. $350. Bert Kanne is a freelance contributor to MBWW with a love for well made dive watches and chronographs. All photos by Bert Kanne unless otherwise noted. I have never reviewed a watch with smaller text. I would like to know why they made it so small.